Eye On Sports Media: Career Choices...Soap Opera Actor or NBA Assistant General Manager? Career Choices...Soap Opera Actor or NBA Assistant General Manager? Give the state of our economy, many of us are wondering what is next as we try to measure our skillsets against the realities of the job market. Some years ago, Neil Olshey was able to offset losing a lead role in General Hospital with a turn towards basketball. 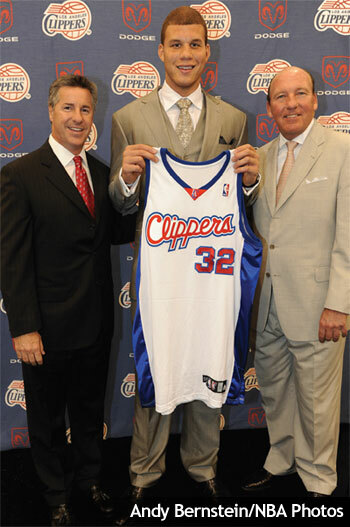 That turn led him to his current position as Assistant General Manager of the Los Angeles Clippers. Here is an article about Olshey, from the Le Moyne College Alumni magazine that we have graciously been given permission to reprint here. Much like the dramatic twists and turns so common in the game he loves, Neil Olshey ’87 has taken a circuitous route to the upper echelon of professional basketball as assistant general manager of the National Basketball Association’s Los Angeles Clippers. standout Blake Griffin to the Los Angeles Clippers. Originally from Flushing, Queens, Olshey attended the Jesuit Xavier High School, in Manhattan, where he lettered in baseball and tennis and played on the New York City basketball AAU circuit with dreams of playing at the college level. Those plans were dashed when he was injured during his senior year. “At that point, I was interested in staying in New York and finding a small liberal arts college that would be far enough from home that my parents couldn’t drop in unannounced,” said Olshey. Le Moyne fit the bill, and he enrolled as an English major, with a career as a lawyer in his initial plans (“Anything to avoid taking math classes,” he said.) He graduated with a bachelor’s degree in English, and minors in political science and philosophy. By then his career interests had changed, and he worked for a short time in sales and marketing in Rochester, before moving to New York City to pursue a career in acting and modeling. He appeared in several television commercials, print ads and had roles on All My Children, One Life to Live, and Loving. Eventually, he made his way to Los Angeles, where he tested for a lead role on the popular soap opera General Hospital. “I didn’t get the role, but it was 80 degrees in March and I quickly realized that if I was going to be an out-of-work actor it would be better to be one on the beach in Los Angeles,” he recalled. He stayed out west and continued to have success doing commercials. Still bit by the basketball bug, Olshey began to volunteer as a coach, eventually finding his way to Artesia High School, a perennial national top 25 scholastic hoops school. As things progressed, he spent more and more time with basketball and less with acting. Eventually, he started his own player development business, running clinics for athletes anywhere from grammar school to college to potential NBA players. His success there led to his being hired by the prestigious SFX Sports Group, where he continued his player development work. His pre-draft camps produced 15 NBA lottery picks, 25 first-round selections and 57 current NBA players. In 2003, the NBA came calling in the form of Mike Dunleavy, a former NBA player and head coach, who had just been hired by the Clippers to be the team’s head coach. Initially hired as director of player development, Olshey spent time as assistant coach before being named assistant general manager two years ago. This past April, he found himself in the equivalent of the NBA catbird seat, with the Clippers in possession of the coveted first pick in the draft. Unlike other years when the number one pick was up for debate, it was unanimous who the best player was: Oklahoma’s Blake Griffin. Sitting in this enviable position, Olshey reached back to his Le Moyne education as he contemplated his next move. He fielded phone calls from all 29 other teams, after the Clippers were awarded the pick, all inquiring what it would take to trade it. Ultimately, the Clippers drafted Griffin and enter this season picked by many prognosticators to make the playoffs for just the fourth time in the last 20 years. Olshey takes a similar philosophy toward his next career move. “Having one of only 30 general manager jobs is certainly something I aspire to, but I have great loyalty to the Clippers. I’ve been fortunate to elevate through the ranks since they gave me my start.” Now firmly an L.A. transplant, he and his wife Leslie are raising two children, four-year-old Connor and James, who is 18 months old. He has continued supporting the College through its men’s lacrosse team. Olshey was a member of Le Moyne’s first team in the sport, and enjoys seeing how far the program has come.